20 years ago, the world was a very different place. In lots of ways, of course, but this particular scene from Sleepless in Seattle where Tom Hanks’ character is about to embark on the dating scene again shows just how much our knowledge of different types of food has changed since 1993. To even be able to contemplate including such a joke in the script, the screenwriter would have had to be pretty comfortable that plenty of people didn’t know what tiramisu was; that for every person laughing at Hanks’ clueless comment, another one would be scratching their head and wondering what this unusual aphrodisiac might be. With 5.3 million pages returning on the search term ‘tiramisu’ on UK Google alone today, that hardly seems possible now. Still, the origin of tiramisu is shrouded in mystery. I won’t bore you with the rehashed Wikipedia entry that seems to grace so many websites – suffice to say most believe it was invented in Treviso at some point in the 1960s, although others suggest its may have originated in Siena, or been inspired by another Italian dessert, zuppa inglese. Regardless of what you believe, one fact – and my favourite – remains indisputable: the translation of tiramisu is ‘pick me up’, referring to the happiness-inducing properties of the coffee, sugar and booze involved in this creamy pud. Last weekend I decided to make a dessert to have after Sunday lunch. I’ve not made tiramisu since I was at university and have been wanting to try my own take on the recipe for a while, but we were celebrating a friend’s birthday and I didn’t want to present her with a great big dish dotted with candles. When it comes to birthdays, it has to be all about the cake, so rather than going back to the drawing board, I decided to convert my tiramisu idea into cake form. Before I ever even contemplated creating my own little corner of the internet, one of my favourite blogs to browse was Almost Bourdain. Unfortunately the author Ellie has since decided to leave the blogging world, but her site is still one of my favourite resources for recipes sweet and savoury (plus she gives measurements given in grams as well as cups, which makes me happy). 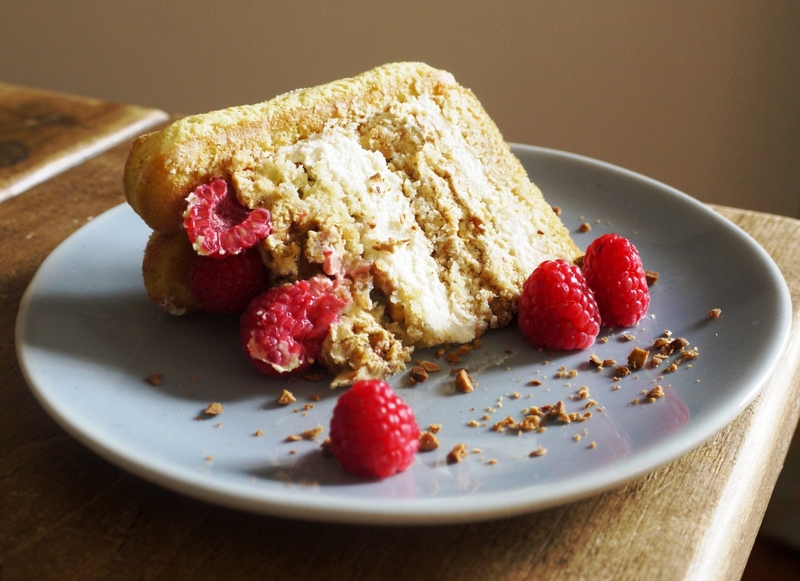 Ages ago I’d bookmarked this incredible eight textured tiramisu she created for a Daring Bakers challenge, so using it as fairly loose inspiration, I set about making my cake. This recipe isn’t entirely faithful to a traditional tiramisu recipe. As one of my friends has (on occasions unsuccessfully, see this post) given up chocolate for Lent, I decided to omit any chocolate shavings or cocoa powder, and since I had half a bottle of Frangelico left over from various kitchen experiments, I used that instead of Marsala. I also omitted any egg in the mascarpone cream as I was looking for a lighter texture that would be creamy, but still possible to slice into layers in my finished cake. If you were being critical, you could say it’s not really tiramisu at all. But if you’re that much of a stickler for tradition, you might not want to make a tiramisu cake in the first place. Your call. One word of warning: this recipe does create a fair amount of mess and washing up. All the processes are pretty simple, but there are quite a few of them, so please don’t embark on it if you’ve only got a few minutes, or are hoping for a one pan wonder. 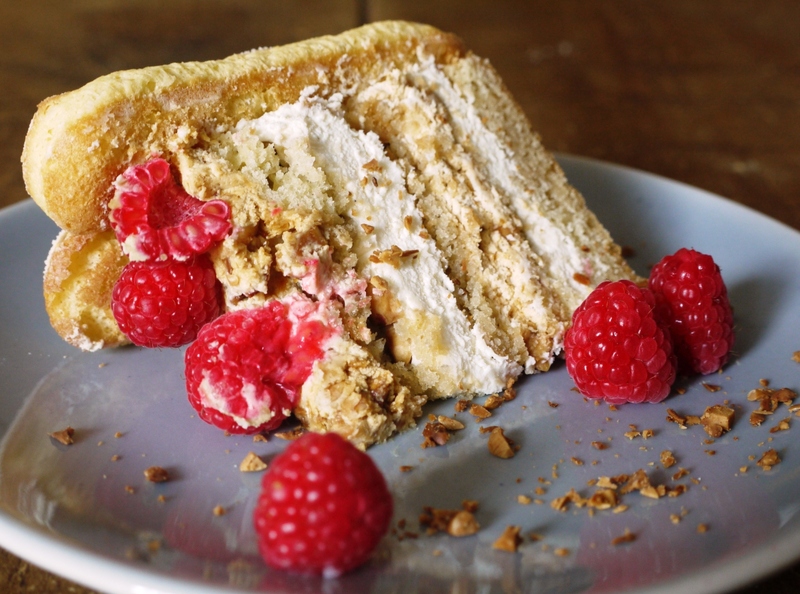 As I was layering it all up on Saturday afternoon, praline crumbled across the counter, four layers of sponge sliced and soaked in syrup, two different types of cream whipped to soft peaks, packets of sponge fingers and a pot of mascarpone strewn around me, Carniverous Boyfriend walked in. He took one look at my masterpiece in the making progress and managed to come up with, ‘You’re going to give us all diabetes.’ Pause. ‘In a good way, obviously’. One of the best rumours I’ve heard about the origins of tiramisu is that it was eaten by Venetian courtesans to keep their strength up in between customers, the kick given by the coffee, alcohol and sugar content contributing to the nickname of ‘pick me up’. And I kind of see how this might relate to my cake, given that anyone who eats a slice will likely soon be flat on their back. However, on reflection, it’s more likely to be the result of a tiramisu-induced sugar stupor than their being in the mood for anything more adventurous . . .
Don’t be put off by all the stages listed below – this cake is actually incredibly easy to make. If you can bake a basic sponge, whip some cream and toast some nuts, you’re 99% of the way there. Enjoy. Preheat the oven to 170 degrees C. Grease and line two 8 inch cake tins. Cream together the butter and sugar until pale and fluffy. Beat in the eggs a little at a time until completely incorporated. Sift the flour then fold into your butter mixture a little at a time, using a metal spoon, until combined. Divide the mixture between your two prepared tins and bake for 25-30 minutes in the centre of the oven, or until an inserted skewer comes out clean. Set aside to cool. Mix the sugar and coffee in a small saucepan and bring to the boil. Remove from the heat, and once cooled slightly, stir in the liqueur. Prick your two sponge cakes all over then drizzle over the syrup, allowing it to soak into each layer. Set aside. Beat together the mascarpone, icing sugar, liqueur and vanilla extract. Whip the double cream to soft peaks then stir through the mascarpone mixture. Set aside. Line a baking tray with a silicone baking mat. Spread the sugar on the bottom of a heavy bottomed saucepan and cook over a medium heat until it begins to melt around the edges. Drag the melting sugar into the centre of the pan with a heatproof spatula then stir gently until all the sugar is melted. Cook until the liquid is a deep amber colour, then remove from the heat and stir in the chopped hazelnuts. Pour the praline in an even layer over your baking mat and leave to cool and harden. Once completely cool, blitz in a blender to a coarse powder. Whip the cream to soft peaks, then stir in the hazelnut praline. Set aside. Line the bottom of a 20cm spring form cake tin with baking parchment. Slice both sponge cakes in half horizontally so you have four thin, round discs. Place one disc in the centre of your cake tin, then working carefully line the outer layer of the tin with sponge fingers. It should be a snug fit – the sponge cake will help the fingers stay put. Spread half the hazelnut praline cream over the bottom layer of sponge, pushing outwards into the sponge fingers to further help hold them in place. Top with a second sponge layer, then spread over half of the mascarpone cream. Sprinkle with a few chopped, toasted hazelnuts. Add your third layer of sponge cake, spread over the remaining hazelnut praline cream then top with the fourth and final sponge. Spread over the remaining mascarpone cream and smooth flat. 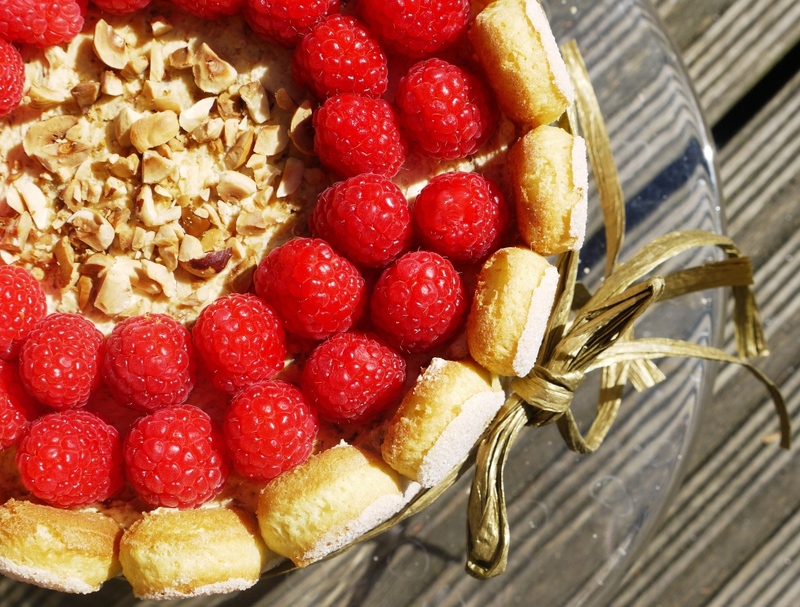 Dot raspberries round the edge of the cake, then sprinkle with chopped, toasted hazelnuts. Cover with foil and put the cake in the fridge to rest for at least four hours. When ready to serve, release the cake tin and carefully remove the outer edge. You should be able to easily slide the cake off the baking parchment, but if it sticks, gently slide a knife underneath to ease it out. Place on a serving plate, tie a ribbon round the outside (if you’re feeling fancy) and serve. Two sponge fingers thick makes the perfect greedy slice, although some people in our party (ok so I was the instigator, followed by two greedy boys but not by my more restrained girlfriends) went back for a third. I’m entering this cake into the Aspiring Bakers Layers of Love Challenge this April, hosted by Sam of Sweet Samsations. I can just TASTE this and love the idea of it chilled. Hazelnuts, coffee, raspberries wow..I’m sure your friend was suitably impressed! I’m not really a cream fan so this looks like a much more appealing way of combining all the flavours. On an entirely separate note, this is beautiful and sounds amazing! Maybe with the exeption of Bagna Cauda, a potent and pungent garlic dip… You don’t want to go too close to anyone you fancy after you’ve indulged in that! For some reason I read that as 8 tiered so was expecting something quite different but that 8 textured tiramisu looks incredible. I love the different flavours you’ve used in yours, I bet it was delicious. The Single Gourmet & Traveller – thanks! Elly – I thought it was because it was so fiery…but both are probably right! Laura – it was delicious. Would love to try the 8 textured version too with all that chocolate sauce, yum. FANTASTIC, words cannot describe how much I love this – tiramisu is a triumph of the dessert world, something you won’t hear me say very often. This looks incredible. This cake is stunning – the flavours and presentation look absolutely wonderful! So many of my favourite flavours in one cake, how can it be anything but sublime! Elaina – I know, I LOVED that film. Good point: it’s amazing how much our collective knowledge of and interest in food has grown in recent years! Your cake looks feather light. I like frangelico better than masala, and this is such a lovely twist! I am always amused reading your blog to see the wealth of desserts I have never tried and tiramisu is another one of them. I’m always torn, I adore coffee flavoured things, but always have a terrible fear of damp sponge (like in trifle) so am scared I’ll hate tiramisu. This cake is the perfect compromise. You’re a genius! Oh how divine that looks! I think it may even rival the Filthy Brownies! But for now the tiramisu cake is a true winner! That’s fantastic!! I’ve never made Tiramisu yet! But I’d like to try!! Mascarpone cheese can be quite expensive though! lol. I love layered cakes!! haha I haven’t watched Sleepless in Seattle in awhile! I had forgotten about that part! And this looks delicious, of course. Love that you turned it into a cake! Sacha – the frangelico adds a lovely flavour, although next time I might add in a splash of something stronger as it’s quite delicate. North South Food – haha, thank you. Bad tiramisu is awful, so you’re right to be cautious. But when it’s good, it’s heavenly. Samology – you should definitely give it a try! My Kitchen Stories – thank you. Erin – me neither, I think it’s definitely overdue a watch! Tiramisu is one of those things I absolutely love to enjoy when someone else makes it. 🙂 Yours looks fabulous! 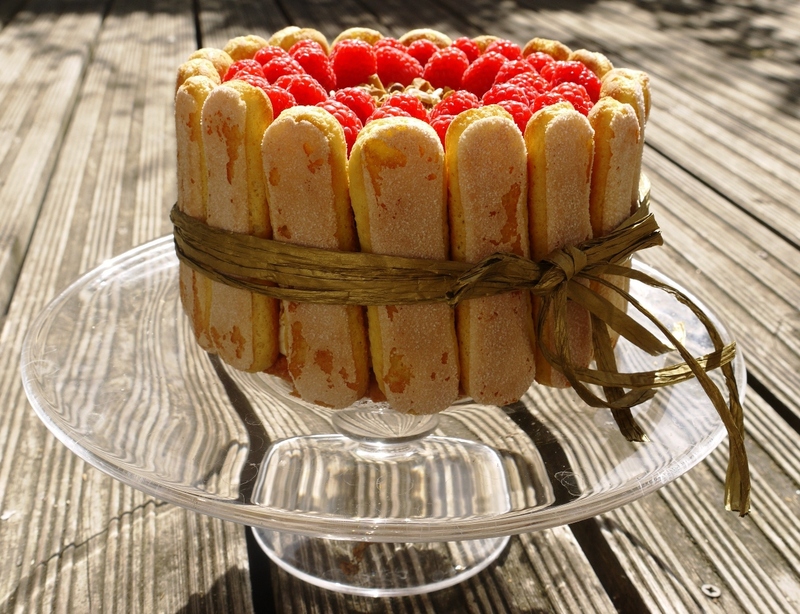 What a beautiful tiramisu, love those red raspberries and the savoiardi cookies around the sides! You really deserve the award I have waiting for you at my place. Hope you have a happy Easter. Your cake looks so beautiful! Love the addition of hazelnut praline cream! yum! (: Thanks for sharing this lovely recipe! awesome looking tiramisu cake! I first made tiramisu in university and it was amazing! it hooked me into baking. yours looks so yummy! Love the way this cake looks! Making tiramisu into a cake is a brilliant idea. This looks amazing and a real labour of love. I remember making my own tiramisu from scratch for a Daring Bakers challenge a long time ago and it created a lot of washing up but it was well worth it. I’m sure everyone enjoyed this cake and it’s so nice of you to made adaptations for your friends. A tiramisu dressed up like a charlotte! I love it. Shuhan – thank you 🙂 The world has changed so much over the last 20 years! Alison – wish I could send you a slice! Lianne – that hazelnut praline is divine, do try it! Delicio8 – I love the traditional version and in cake form…basically I’m just greedy! I love how you’ve arranged this with the stand up sponge fingers, it looks stunning. Not made tiramisu apart from a Daring Bakers’ marathon a few years ago where we had to do our own mascarpone and zabaglione and the biscuits from scratch – possibly the work involved has put me off ever since but you’ve reinvigorated my enthusiam to make it again! Oh yum 🙂 you’re cakes are always SO SO SO pretty!!! I’d love to try this ~ I never use to like tiramisu cakes but then I started drinking coffee and started to like tiramisu cakes 😀 I’d love to try a piece because I really like hazelnuts hehe ~ YUM YUM! Also, Carniverous Boyfriend’s comment = win. While He Was Out – aw, thank you! Daisy – thank you. There’s only a little coffee in this, so good whether you love it or not! Oh the layers 🙂 beautiful!! Yasmeen – I think this would be perfect for a baby shower 🙂 enjoy! what a great photo! 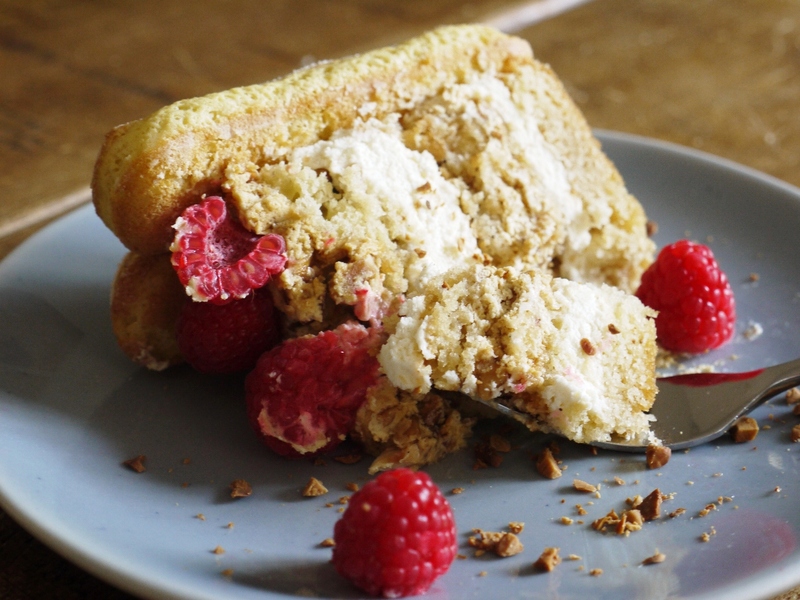 I love tiramisu…but I do find it a little heavy, so raspberries are a super addition – a really good way of lifting it. epic! ooohh goood! I have a confession to make I have never tried tiramisu not even once – I obviously have not lived. Wow. This looks incredible. Adding it to my list of must-bakes! I made this dessert and everyone loved it. I had to make the sponge twice because the first mixture didn’t rise much. I looked back to see whether there were any differences between this mixture and Delia Smith’s recipe and she had added an extra 1 teaspoon of baking powder. I remade the sponge and it turned out slightly more risen which allowed me to slice the cakes horizontally.